The transition from fee-for-service to value-based reimbursement represents a paradigm shift for the entire healthcare industry but also promises specific opportunities and challenges for individual providers. If you’re considering transitioning to a value-based reimbursement model, it is important to learn as much as possible about the two systems, the changes ahead of you, as well as your strategic options. What is Fee for Service? Fee-for-service (FFS) is a payment method wherein physicians and other healthcare providers are paid separately for each unbundled service. In health care, it introduces an inherent incentive for providers to provide on the quantity of care (office visits, procedures, tests, treatments, etc.) rather than quality of care. It has been described as an addiction by a physician and former healthcare CEO, and for good reason. Fee-for-service incentivizes providers and organizations to simply do more whether or not the additional care improves patient lives or outcomes since a fee is paid for reimbursement. It’s a system that, once started, is hard to move out of. As patient expectations have risen, and the complexity of diseases has increased, this approach to healthcare reimbursement has made less sense, especially as it has been proven to increase costs over time. This understanding has led to a preference for reimbursement models that encourage providers to focus on value and results instead of service output. While the Affordable Care Act included provisions to encourage doctors to increase the value of the care they provide, more than seven years later we still find that anywhere from 86 to 95 percent of healthcare providers in the U.S. still receive reimbursement for the individual treatments, tests, and procedures they perform. Perhaps the biggest challenge though is that individual providers strongly prefer the fee for service model. Bain & Co. estimates that as much as 73 percent of physicians prefer service-based compensation over pay-for-performance and capitation models. What is Value Based Reimbursement? Value-based reimbursement is a relatively simple concept that is much more complex in application. This methodology uses financial incentives to move providers away from volume-based motivations and toward models that are focused on increasing quality outcomes and decreasing cost of care. It is an ideal that has given rise to a wide range of options in transitioning away from fee-for-service models. Value-based care is healthcare delivery model in which provider reimbursement is tied to the quality of care provided (measured by patient health outcomes) and rewards providers for both efficiency and effectiveness. Under value-based care agreements, providers are rewarded for helping patients improve their health, reduce the effects and incidence of chronic disease, and live healthier lives in an evidence-based way. Under this system, physicians will also be compared to peers in the same specialty or to themselves as a reflection of their resource maximization from year to year. APM works within an ACO, guaranteeing a five percent increase in payment each year during the first six years of the program. APM though, is also a higher-risk model, since physicians who don’t measure up to the metrics of their ACO won’t reap the benefits of their shared savings. 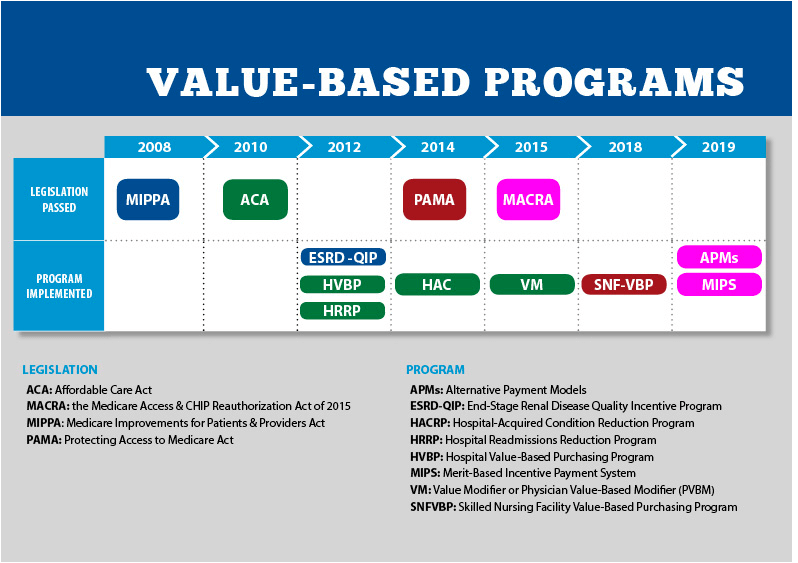 Value-based reimbursement though, is much larger than MIPS and APM. Here are a few examples of models that will be helpful in understanding what this approach to reimbursement can potentially look like for your practice. Financial incentives are tied to performance to encourage better clinical outcomes. Individual providers within an organization are rewarded based on predefined quality metrics that stand relative to other providers regarding performance and ability to lower costs. Who it benefits: Providers looking to reduce errors, improve efficacy, and increase physician engagement. These programs provide rewards for providers who reduce their spending to or below a level set by a payer. They incentivize providers to spend less on patient treatment (than they would in a FFS arrangement) and entitle them to part of the savings. Who it benefits: Healthcare organizations who don’t want to make huge investments in technologies. In a Shared Risk model, providers are given savings targets. If the targets aren’t met, they might have to share cost savings with insurers but are also at risk of paying penalties as compensation if the cost of healthcare services exceed expectations. Risk can be limited if providers pay a fixed fee to a third-party insurer who in exchange, takes on the financial risk of excessive costs. Who it benefits: Providers who are confident in their ability to keep costs down. The Bundled Payment model involves an arrangement with third-party payers where they provide performance and financial accountability for set episodes of care. 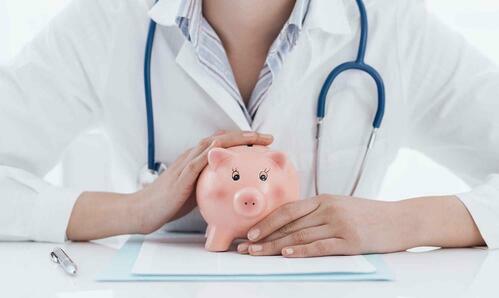 Providers can generate savings by eliminating unnecessary care episodes and improving efficiency. Fixed payments are made to providers based on clinical standards of risk stratification, care, and balanced scorecard performance. Who it benefits: Providers who are particularly efficient and focused on metrics. Accountable care organizations are probably the most well-known value-based model and are volunteer-based programs in which physicians and hospitals are paid by health plans to improve outcomes and meet specific quality metrics (for good reason). They can involve payment models including value-based purchasing, shared savings, and pay-for-performance. Providers themselves are “accountable” for health management of their enrolled patients at all levels of care and in turn, are entitled to bonuses for slowing spending growth in comparison to peers in a determined region. Who it benefits: Practices who can afford higher startup costs and stay under expenditure targets. What are the Requirements of Value-Based Reimbursement? It’s critical that everyone in an organization transitioning from a FFS model to value-based care understands the scope of the change that has being taken on and be properly informed and prepared. How Can You be Successful with Value-Based Reimbursement Models? Success in a transition to value-based reimbursement is highly dependent on establishing goals that work for your organization and deciding on a model that best fits those goals. It is critical that, before making any decisions, you understand the challenges that you might face and create a comprehensive strategy that directly addresses those challenges as a path to your desired outcomes. How these benefits are realized will depend on individual organizations and implementation. Before you start to pursue those benefits, it is important to understand that the transition to value-based reimbursement represents not just change for your organization, but a paradigm shift for the healthcare industry overall. Value-based reimbursement is truly a step away from fragmented care models and represents a future that holds healthcare organizations responsible for controlling costs, keeping patients healthy, and seeing improvements in quality. It also means an industry-wide shift into a period of monitoring and evaluation as we test the viability and outcomes of an unprecedented transition in the U.S. healthcare system. Even with a full understanding of all the options possible in value-based care, transitioning will be a challenge for any provider or organization. However, understanding the likely hurdles can help smooth much of the journey. Understanding (and navigating) the true costs of delivering care: Organizations will need not only sophisticated accounting capabilities but also the ability to ride out a drop in revenue and the number of procedures performed. Shifts in processing, billing, and collections: This will likely require major investments in data analytics to find success. A lack of standards: There are currently no standard protocols to follow to transition into value-based care and unfortunately, also little evidence-based research, leaving providers open to the risk of penalties. A focus on driving out waste: Providers should understand which service lines perform the best for them and how to keep their costs below those of their competitors. Choosing the ideal model: While there are a broad range of options, evidence-based research on pioneer models will give insight into decisions and value-based contracting processes that best align with your goals. Collaborating with other providers: Investing in analytics and tracking quality measures can be expensive and collaboration can help cut costs. Evaluating results: Outcomes of strategic choices should be evaluated periodically even while working to increase patient volume as a buffer against risk and decreased procedure volume. Investing in data sharing and integration: This investment will serve as the foundation of streamlined informational processes among network providers. Ultimately though, the goal is to standardize patient care processes and focus on wellness instead of individual care episodes. Clinicians focused on preventative health will be much more effective in a value-based system that those that are fee-focused. Value-based healthcare is the inevitable future of healthcare, and it is one that will rely heavily on not only strategy but also the right technology. Small clinics, in particular, will need an integrated EHR and practice management software to help their patients and staff navigate the transition successfully. These clinics should look for software that promotes collaboration, emphasizes analytical reporting, and facilitates integration with existing third-party software and hardware. This is a great place to start.